Friday night: Mostly cloudy, lows near 40, light wind. 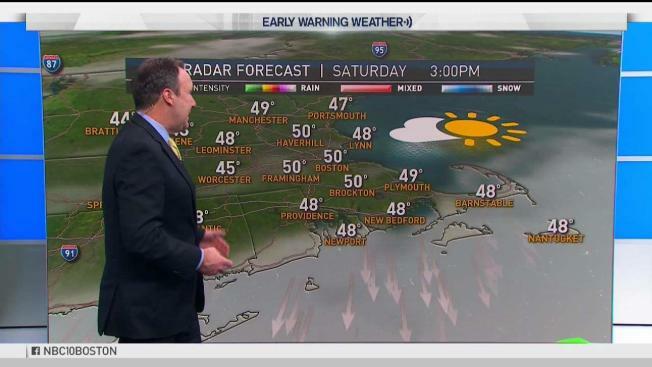 Saturday: Sunny north of Boston, partly cloudy south, highs near 50, light wind. Sunday: Mostly cloudy, highs near 40. After days of below average temperatures, we’re finally warming up. Highs on Friday reached the 40s in many spots, with thickening clouds ahead of a storm that creeps closer this weekend. The storm will have a hard time advancing into New England, at least initially. On Saturday that means we’ll wake up with clouds and a few showers south of the Massachusetts Turnpike, with morning temperatures in the 30s to near 40. By afternoon any showers will move out and many of us will see at least some sunshine with highs in the 40s to near 50, before a late day wind shift brings back some cooler air. On Sunday that cooler air is in place, meaning we wake up with 20s and 30s. By afternoon we rebound into the 30s and 40s as clouds and rain showers move back up from the south. Late Sunday into Sunday night some of that rain will mix with and change to snow in areas north and west of Boston. The storm begins to pull away on Monday, but that also draws in colder air, so even areas near the coast may have to deal with snow or a wintry mix. Sunshine and cold air returns Tuesday, with snow showers in the mountains, before a quieter mid-week stretch. Two more systems may then impact New England, one next Friday, and another just before or around Christmas Eve.